In which sectors have software companies created the most financial value? I asked myself this question over the weekend. I categorized the top 250 IT companies which spans $675B in market cap (AAPL) to $3B in market cap (ASOS) and created the chart above. B2B Software, which includes Microsoft, Oracle, IBM, and SAP among others represents about 30% of the total IT market cap today. The consumer web (GOOG, FB, Baidu, eBay) is second at 20% of market cap. Semiconductors and Consumer Hardware (led by Apple), tie at 17% each. Most of these very valuable companies are older than I thought. Below, I’ve plotted the year of founding of each of these 250 companies. 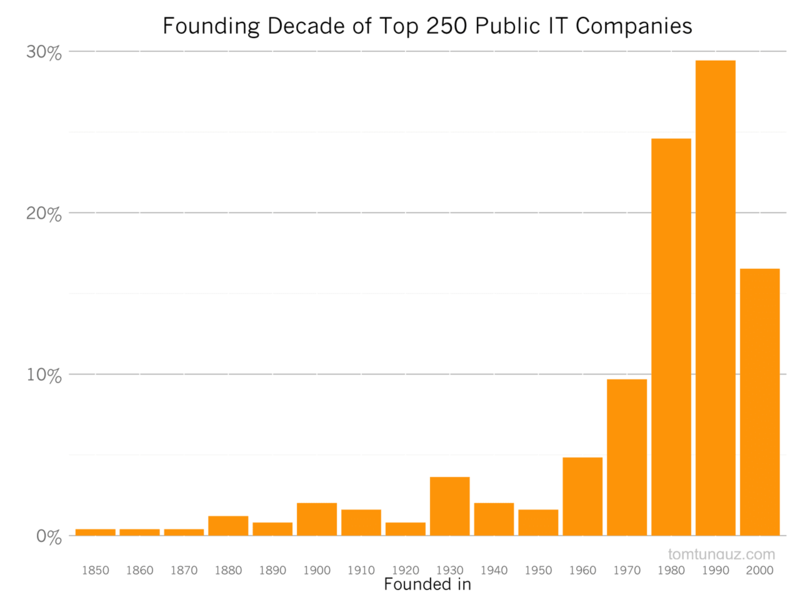 13% of the top 250 IT companies today were founded before 1950. On the other hand, companies founded since 2000 account for 19% of the stock tickers but only 10% of the market cap. In other words, these younger, newer companies are smaller on average. Aside from being a great decade for music and fashion, the 1980s saw the founding of today’s largest IT companies with a median of $9.3B in market cap across 24 companies including AAPL, ORCL, MSFT, SAP and EMC. Over the next ten years, I suspect we’ll see the next generation of B2B Software companies rise to the same levels of market caps as these big names. The opportunity to replace these companies’ aging technologies is simply massive. Let’s break these trends down by sector as a proxy for innovation rate. Not surprisingly, the most valuable Consumer Web companies have all been founded after the invention and widespread adoption of the internet. 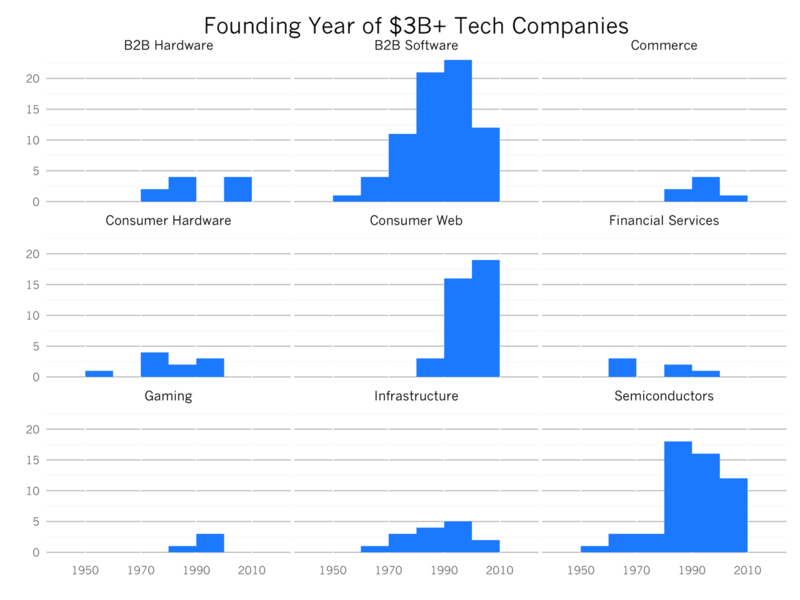 B2B Software is also witnessing rapid innovation with big companies built in the last 10-20 years, which supports the idea that we’ll see some huge SaaS businesses in the future. In contrast, Financial Services hasn’t seen a new $3B+ company created in a while, indicating there’s likely quite a bit of opportunity here. LendingClub’s pending IPO will change this to a certain degree. 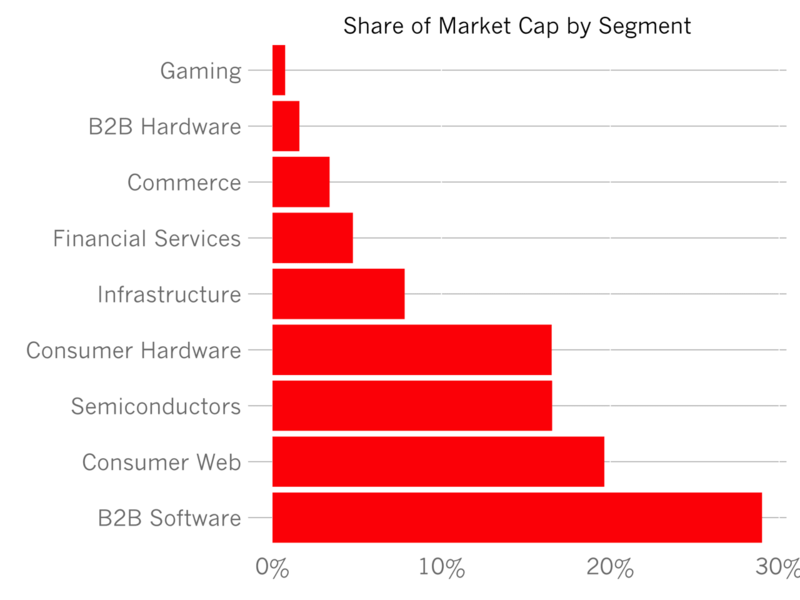 B2B Software will remain the biggest category by market cap for a long time implying there are huge opportunities there for new SaaS startups to disrupt.